Chinese foreign minister Wang emphasised the three countries had great international responsibilities and needed to keep playing a positive role for ensuring positive energy to the world. "China, India and Russia are the three countries with a broad influence and are the emerging markets and have come to realise the international responsibilities on them and are ready to play a positive role for ensuring more positive energy to the world," he said. Wang added, "In the just-concluded meeting, we held an in-depth discussions on the international situation and major issues of common interest. This was an efficient, practical and successful meeting." Lavrov said the three ministers had a candid, trust-based and frank exchange of views on a majority of issues. "We had a candid, trust-based and frank exchange of views on a majority of issues. We share our position and this unity of our approaches and our interest has been reflected in the in-depth and specific joint communique that we circulate following our meeting. We are concerned about developments that we witnessed today - such as evasion of the international law and growth of force and factor force in the international affairs," he said. 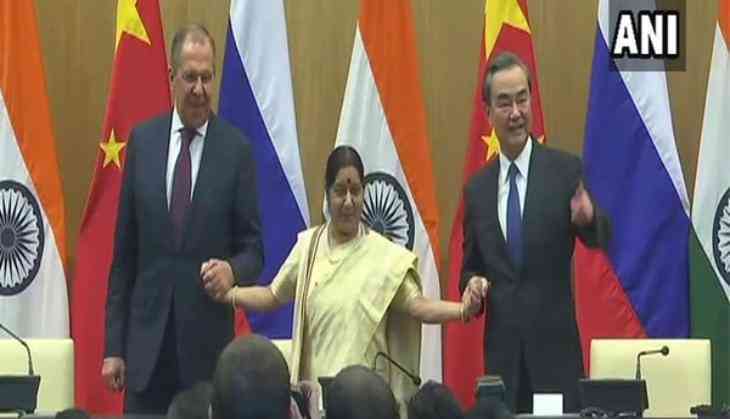 Foreign Ministers of Russia and China also welcomed the accession of India as a full-fledged member of SCO at the Astana SCO Summit in June 2017. Russia and India also extended support and cooperation for China as the chair of the Shanghai Cooperation Organisation (SCO) for 2017-2018 and for China's hosting of 2018 SCO Summit.